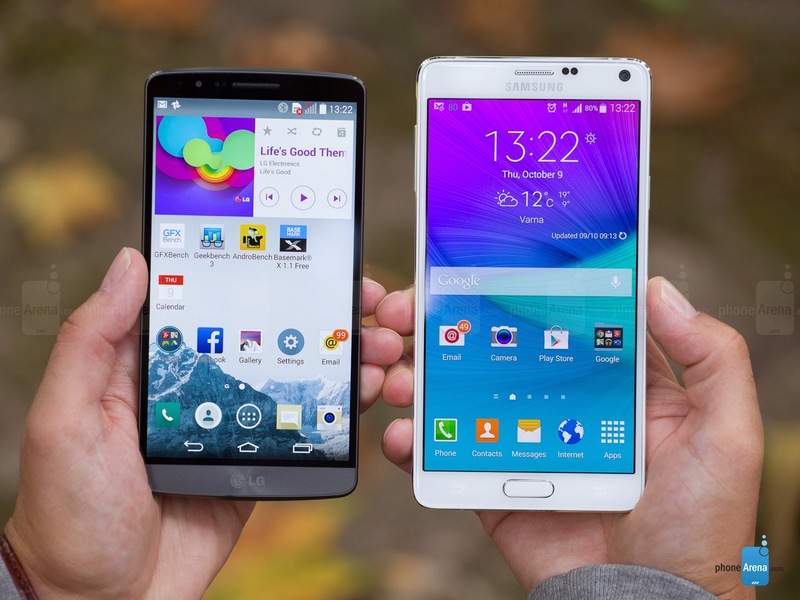 Head to head comparison of LG G3 vs Note 4, the two favorite Android devices of 2014. Samsung Galaxy Note 4 comes with a metallic frame which is an evolution from its predecessor Galaxy Note 3 and Galaxy S5. The corners are little squarer and the back panel gives a leatherette plastic look. The LG G3 comes with the first ever QHD LCD display at 5.5 inches and 2,560 x 1,440 pixels. But on the technical side it had some of the issues. But don’t worry not many that you'd see as a huge problem, it is still super sharp. It lacks the brilliance and dynamic range when compared to the Note 4. The Note 4 also rocks with a QHD resolution at 5.7-inch AMOLED display, giving it slightly less pixel density but much higher contrast, saturation and brightness. The more subdued palette and softer tones of the G3 is appreciable while Note 4 dazzles and is easily the best display that you will ever see on any phone. The G3 comes with a Qualcomm Snapdragon 801, 2.5 GHz, Quad-Core, Adreno 330 processor and a 3GB RAM. The Note 4 comes with a powerful Qualcomm Snapdragon 805, Quad-Core, 2.7 GHz, Adreno 420 / Exynos 5 5433, Octa-core, 4 x 1.9 GHz, 4 x 1.3 GHz, Mali-T760 processor and a 3 GB (32 GB version) / 2 GB (16 GB version) RAM. The G3 has an excellent Knock On (double tap to wake) and Knock Code for super secure lock screen access. The Note 4 comes with S Pen stylus. It is the backbone of the Note, but Note 4 is a great device with or without the S Pen stylus. The G3 comes with running Android 4.4.2 (scheduled for Android 5.0 this year, as is the Note 4) with several modes like Dual Window Mode, Guest Mode, QSlide floating mini apps, Knock on and Knock Code, Guest Mode, gesture controls etc. The Note 4 comes with running Android 4.4.4 and Samsung's TouchWiz interface. The battery saving modes helps you to increase the life of the phone with several other modes like Multi window mode, Guest Mode etc giving an ease of access. The G3 has a 13 MP, OIS with laser autofocus Rear camera and 2.1 MP front camera. The Note 4 has a 16MP Rear camera with OIS and a 3.7MP front camera. The comparison of LG G3 vs Note 4 would now have given you some idea and would help in your buying process.